Home Events World Rafting Returns to Futaleufu After 20 Years! World-class rafting competition is returning to Chile’s Futaleufú River after a 20-year hiatus. In March, the IRF announced that in March 2020 it will once travel to the legendary whitewater of Chile’s Futaleufú to host an historic 20th anniversary rafting event – the 2020 IRF Invitational World Rafting Cup. 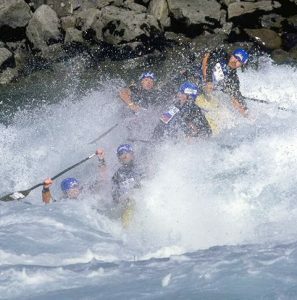 In 2000, the IRF organized the Camel White Water Challenge on the Futa in Patagonia Chile. Since then, rafting athletes from across the globe have placed the Futaleufú near the top of their ‘wish list’ for where they would most like the IRF to organize another event. In 2017, the IRF began discussing plans with the Municipality of Futaleufú for a repeat visit. “We are now excited to announce that the IRF President recently met on the riverbanks of the Futaleufú with all relevant bodies to sign an historic partnership agreement,” says IRF president Joe Willis Jones, adding the agreement has the signatures of the Futaleufú Municipality, the Los Lagos Regional Government, the Chilean Ministry of Sport, the Chilean Ministry of Tourism, and the Chilean Ministry of Economy. Racing will follow the globally recognized IRF Race Rules in the R6 format. All four disciplines will be conducted, likely with a twist that endears itself to the big volume water. The IRF has been tasked with selecting the best teams in the world to compete at this historic event; the top fifteen teams competing at the IRF World Rafting Championship in Tully, Australia, will receive a special invitation to compete in this prestigious and historic event in Futaleufú, Chile. He adds the organizers expect to receivefunding to fully cover all team expenses, including round trip airfare from their home country, ground transportation, lodging and food during the event.